Im working on a step sequencer (again) and i have come to the following crossroad. Need to decide wether the step led is going ot be used for showing the progress of the sequence (1 to 8) or when the correspondent step is off ( via a switch) the led will also turn off. I have been looking at fonik´s baby 10 sequencer and Hexinverter simpleSeq and in both cases leds remain on even if the step is off, therefore independent of the switch state. I was wondering if there could be a way where the led would be brighter when the step switch is on, and dimmer when its just showing the sequence progress or the step is off. Im sequencing with and arduino, that sends a voltage that is forwarded to a potentiometer that goes to a common CV bus out jack, and a switch that goes to a common gate out jack. Any ideas on how to achieve this without coding? Im running the sequencer on a nano and im short on pins. Edit: Maybe if i run the signal trough a 10k resistor into the led, (which has an internal resistor) the led will be dimmer and when the step is on, it will get the full 5v bypassing the 10k resistor and being more bright? With the Baby 10 it's just a matter of where you put the step on/off switches and what type of switch you choose. 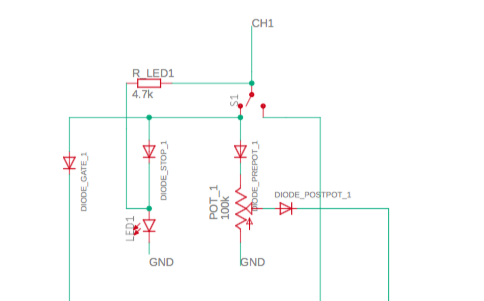 If you put a switch right after one of the 4017 outputs the step signal will not go anywhere and you got both led and CV/Gate OFF on that step. This way you may be a bit lost in slow sequences with no led showing the current step but you get what you want using just one led per step. The idea of brighter leds is a bit more complex but maybe it could be cheaper than using two leds per step.